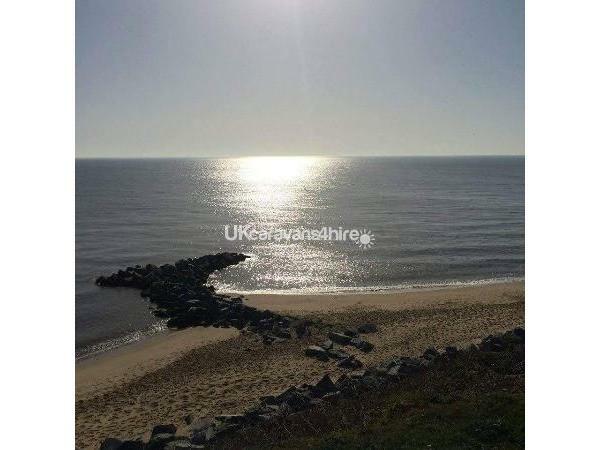 This South facing Prestige” 3 Bed, 6 berth Holiday Home is Double glazed and centrally heated and situated at Haven Hopton Holiday Village on the east coast of England, between Norfolk and Suffolk. 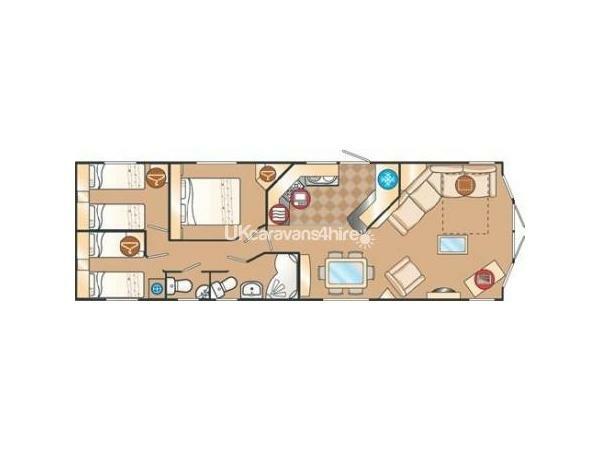 This fantastic caravan is on the 4* Haven holiday park and is only 5 minutes walk from the Sandy beach and entertainment complex, and a 10 minutes drive from Great Yarmouth in the north and Lowerstoft in the south. Hopton is a Small tranquil English village with shops, takeaways, pubs and restaurants close by. 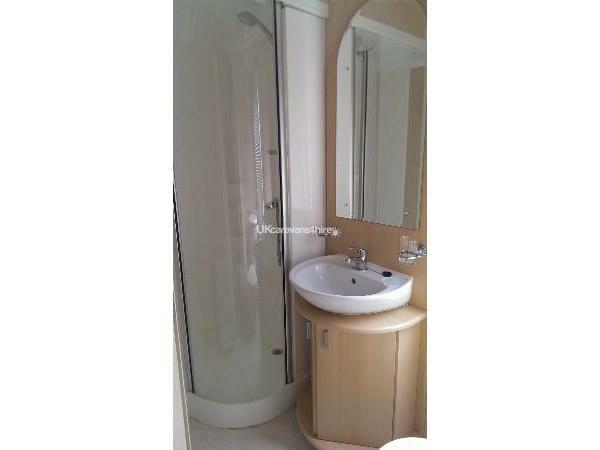 The Bathroom has shower, toilet and wash basin , plus there is an extra toilet and washbasin located near the bedrooms. Double doors open off the Lounge area to the south facing decking, or you can lounge outside on the Large Patio area. 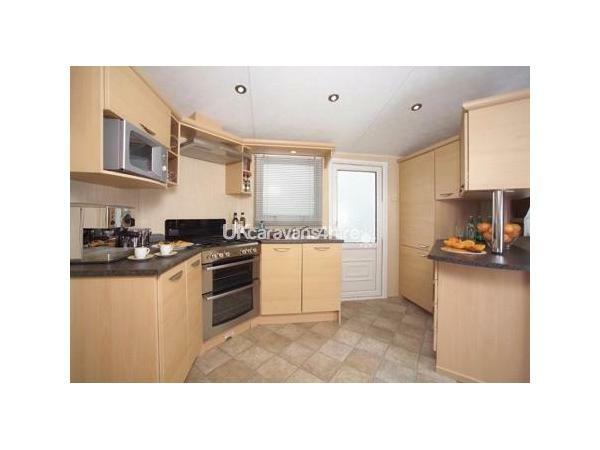 The caravan is situated on the quite and relaxed Waterways area of the Hopton site. There is a £50 non refundable deposit payable on booking with the balance to be paid 8 weeks prior to holiday. A £50 breakages deposit will be required when sending balance, but returned within 10 days of you vacating caravan if all well with the holiday home. If late booking ALL hire cost payable at the time of booking. Prices quoted do not include bed linen or entertainment passes. Bed linen can be hired from Hopton Holiday Village Reception (01502 730214), but most hirers like to bring their own. Entertainment passes can also be purchased on arrival at reception. 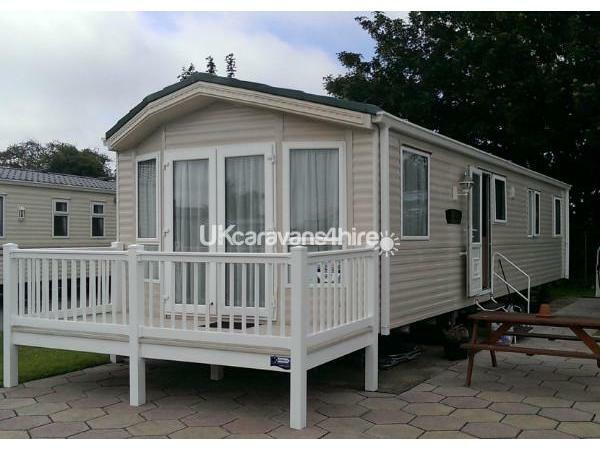 Had a great week in this caravan with my family..very good location to entertainment complex and the beach.caravan very clean and spacious.south facing verander was great to relax on.would defintely book again. Just got back from a week at hopton, the location of the caravan was outstanding. the caravan was amazing plenty of room for 2 adults and 3 teenagers. 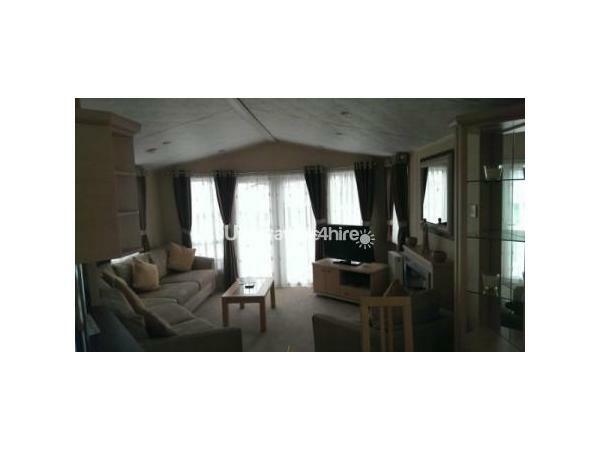 Wouldnt hesitate in recommending the caravan to friends and family. 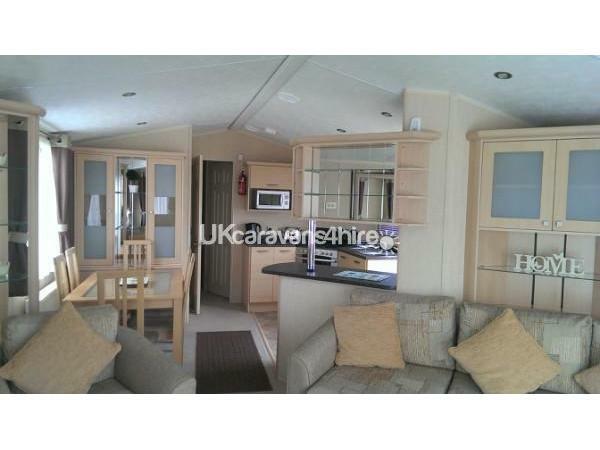 SUPER CARAVAN - INTERNAL DESIGN SEEMS TO OFFER MORE SPACE THAN USUAL AND (DUE TO WEATHER). CAN CONFIRM THAT HEATING WORKS EFFICIENTLY. SHORT WALK TO BOTH THE BEACH AND MAIN COMPLEX. OVERALL ASSESSMENT - PERFECT !. Brilliant caravan. There was plenty of room for 4 adults and 1 child (6yr old). The cleanliness of the van was 100%. Communication from Dave was great. We would definitely look to hire the van in the future. Thank you David & Pat for the great review, and so glad you and the family enjoyed your stay . We have just returned from a week away staying in this lovely caravan. It was our first time at hopton holiday village and I feel we couldn't have picked much better accommodation! 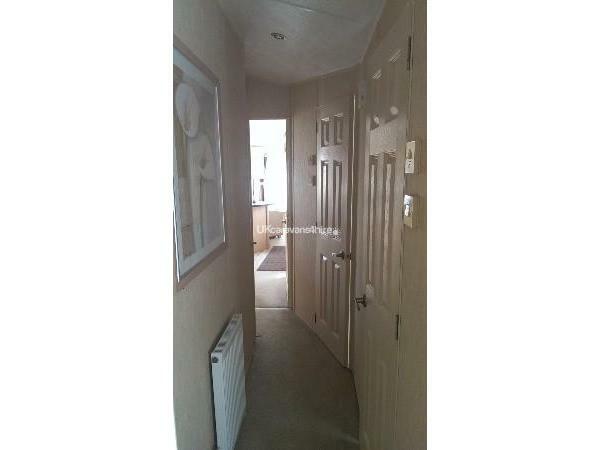 It's situated in a perfectly quiet spot yet only a couple of minutes walk from everything. Our group consisted of 4 adults & 4 children but never felt over crowded. Everything was clean, bright, spacious & well looked after. The shower was really powerful & held a great temperature (also big enough to sit 3 children in after a trip to the beach!) It had everything you needed & would love to stay there again. Thank you Dave & Chris! Just returned. Had a great time. Caravan really clean and comfortable. Near to beach and club. Quick response from owners and very friendly. Received message from owners to make sure everything ok. Very pleasant. Thank you. Many Thanks you for the review, and glad you enjoyed your stay . CARAVAN IS ABOUT 5 MINUTES WALK AWAY TO THE BEACH WHICH IS IDEAL FOR CHILDREN. CARAVAN WAS VERY CLEAN AND TIDY WHEN WE ARRIVED AND THE SITE IS CLEAN AND QUIET. THE CARAVAN IS NEAR TO ALL THE FACILITIES WE HAD A GREAT TIME STAYING HERE .WE WOULD CERTAINLY BOOK AGAIN. Thank you for the review, and glad you enjoyed your stay . Many thanks for the review . So glad you enjoyed your stay and thanks for the review. Hope the weather will be better for you next time. 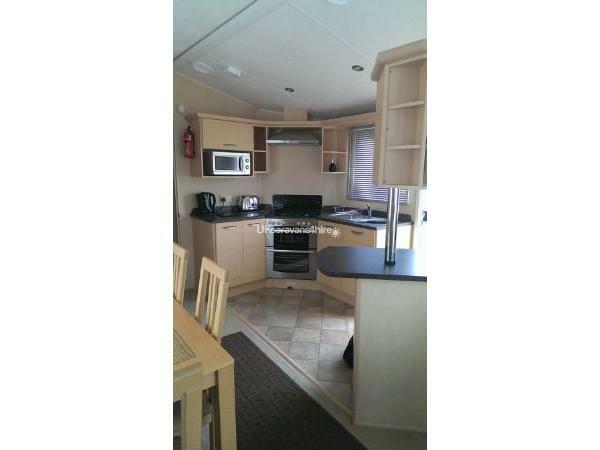 Lovely caravan lovely spot great for the kids short walk to complex and the beach.swimming pool is fantastic for all the family would recommended this caravan and park . We stayed here the same week during 2014 and within an hour of returning home had re-booked for 2015. Only the fact that we are getting married next year has stopped us booking a third year. A good, clean caravan in arguably one of the best spots on the site. Five mins stroll to the main complex and pool and less the the steps down to the beach. Highly recommended. Mike , Many thanks for the review . So glad you enjoyed your stay and thanks for the re booking. Hope the weather will be as good as you had this time.